Maximizing your day to day productivity can be hard no matter what profession you’re in. However, the task of “getting stuff done” or moving forward becomes increasingly hard when you add the element of caring for live animals and dealing with unpredictable weather. For a cattle producer, time management is an art and is vitally important to your success. Cattle producers have the duty to complete day to day tasks on the ranch, deal with numerous crises at once, and, all the while, move their genetic program, nutrition program, marketing program, etc. in the right direction for the success of the company. Each one of these items can actually be more serious in this profession as compared to others. For example, day to day tasks and crises involve live animals that MUST be cared for whereas crises and tasks in other professions may not involve such serious consequences. In addition, whether your customer be a feeder, a commercial producer or anybody else, customer service can affect your customers’ livelihood and not just their “buying experience”. So how does a professional cattle producer deal with such large responsibilities on a day to day basis and still achieve success? Some tips can be taken from other industries, which is why we’ll use numerous surveys involving some of the most successful people in the world. Other techniques only apply to the cattle industry and to beef producers so those techniques were acquired through numerous interviews with some of the most successful cattle producers in the United States. Different people can have different focuses, but the point remains the same; no matter what your focus is, keep your eyes on the prize. Don’t lose focus of the goal because you’re too scared to take your eye off the commotion at the line of scrimmage. Keep one eye downfield always with the intent of moving forward. Of course, this is assuming you clearly have your goal identified. If you don’t, identify it because it’s hard to get somewhere if you don’t know where you’re going. These goals vary from providing a place for your kids to come back to work on to owning your own business. Many producers’ primary goal is to bring glory to God. Lynn Pelton of Pelton Red Angus and SimAngus says that bringing glory to God is and was their first goal when they started in 1972. “Everything seems to work and fall into place when we have our priorities straight both spiritually and with our families” says Lynn. Larry Mehloff of 5L Red Angus agrees that having a larger focus is important and, like many others, says his goal is to serve God. Whatever your goal is, it will largely determine what you do from day to day and how you do it. 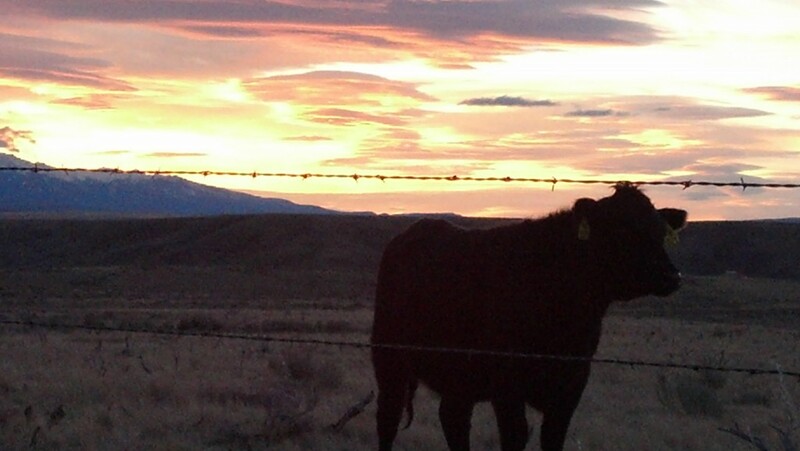 Being goal oriented is common among successful people in and out of the beef industry. Keep your eye on long-term goals (the Super Bowl) and short-term goals of different levels (the first-down, the end zone, or the win). In regards to short-term goals, Mark Gardner of Gardner Angus Ranch says he prepares for his next sale all year long, starting from the day after his last sale. In addition, keep these goals or focuses close by to remind you what you’re working for and as motivation. Jim Butcher of Gateway Simmental uses benchmarking as a means of attaining and measuring the progress of these goals. Benchmarking can prove very useful by measuring ones productivity and critiquing the reality of goals and the means you are going about attaining those goals. This sounds a little confusing, but the concept is simple for cattle producers. If you count on the work day offering some time for you to catch up or work on that special project it will never happen. The sort of work we’re talking about is the stuff that will have great returns and move your program forward. All too often this “important” work is drowned out by “urgent” work that fills up our schedule. The vast majority of successful seedstock producers interviewed said they get their “important” work done early in the morning before the work day or late at night after the work day. This is common in other industries as well. When a large number of successful CEOs were interviewed regarding their most productive time of day and location, virtually no one answered any time between eight and five and at their work place. The typical work day for these successful workers was to wake up between 4:30 am and 5:30 am, starting with some sort of morning ritual that varied between workouts, catching up on the news, reading a book, the paper, the bible, etc., and then around 6:00 am to 7:30 am they got work done that they figured was key to the success and advancement of their career and/or their company. Once the typical work day started it was filled with responding to problems (often other people’s problems) answering phone calls, day to day tasks, meetings, etc. When the surveyed group of successful cattle producers were asked this question, their answers were very similar. Jim Butcher calls these periods of the day his “big thinking” time and also devotes any driving time he has too “big thinking.” Early in the morning and late at night is also a time when your alertness tends to be a higher so devoting that time to the more important work seems wise. The main point is that you must be very intentional about scheduling time to get those important tasks done whether you’re building a new website, making a breeding plan, pursuing new options to market cattle, etc. If you are not intentional about this, the urgent will typically drown out the important. This sort of time management becomes increasingly important on a ranch as your time because consumed with calving, haying, etc. and the important stuff may never get done. There is another benefit to starting your day off with this sort of work. Typically, successful managers will know or write down exactly what they are going to work on first thing in the morning during this productive time. They sleep better being that prepared, they get right to work on it since that time has already been set aside, and they start their day off on a great note accomplishing or working towards the accomplishment of something very important. This will put you in a good mood right of the get go and set the pace for the rest of the day. You may not have a huge staff working for you but most people have more help (family, friends, employees, etc.) than they think. The problem is, nobody can do it as good as you can. You may have noted a bit of sarcasm, but this may actually be true. However, it does not mean you need to do everything. You may have to think back to Econ 101, but the concept of comparative advantage and absolute advantage is very simple. You may be able to do something better or cheaper than someone else, but if that means that you are not spending your time doing something with a far greater return and utilization of your talents you are not maximizing your production. Focus on what you’re good at and delegate out the stuff that takes you away from the important stuff. This may mean contracting work out or trusting your family or employees more. Some things that pop up, like a cow with calving difficulty, just need to be dealt with right now. Others you have the power to prioritize. All of the seedstock producers interviewed put a high priority on day-to-day tasks involving customers. Mark Gardner maintains a 48-hour rule in which he makes sure to call people back within 48 hours no matter how busy he is. As cattle producers, we cannot just work on the first thing we see that needs to be worked on because, if your ranch is anything like mine, you wouldn’t make it very far from the door each day. List the tasks that need to be done and prioritize them. Write them down in order and schedule them into your day. Scheduling these tasks will force you to consider and reconsider the importance of tasks and how long they ACTUALLY take. Perseverance is key to any successful company and becomes increasingly important on a beef operation. In order to assure longevity at a productive rate, it is important to make sure you are meeting your family’s personal and spiritual needs, and secondly, your own needs. Make sure to schedule in time with your family. Again, it is imperative that producers schedule this time intentionally to make sure that it happens and does not get put on the back burner. Forming these habits and practicing self-discipline is essential to your success. These steps must become regular practice for them to work. Do not fall back into an undisciplined schedule going every which way the day blows you and hoping that someday you will end up where you want to be. You will inevitably fall short in some area if you do not practice discipline.